This Eyes on Luxe list is perhaps the most recent compilation of world’s most expensive tea-ware. With a collective value of over 10 million dollars, many of these teapots are some of the most desirable & collectible design-ware in the world. 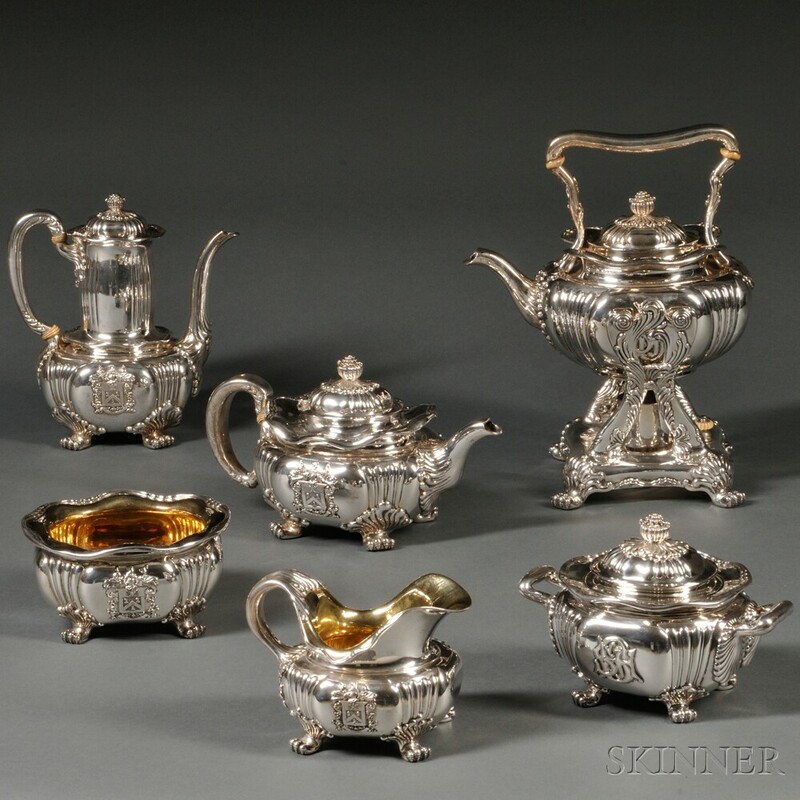 This six-piece sterling silver tea and coffee service made by TIffany & Co in New York in 1873-85 was sold at more than four times the original estimate by Skinner Auction House in Boston in January 2014. 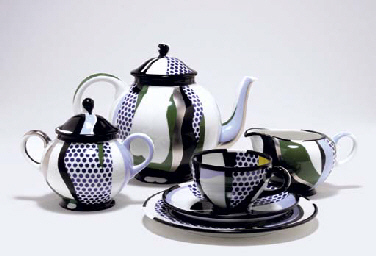 Made in 1984, this tea set of 21 glazed, coloured ceramic dishes designed & signed by American pop artist Roy Lichtenstein fetched $31,200 when it went under the hammer at a Christie’s auction in New York in 2006. Yet again, a 7-piece tea set designed by Tiffany & Co. in the 19th century was sold by Tiffany itself for $54,012. Handcrafted by Josiah Wedgewood this 1765 teapot with a colonial protest message: “No Stamp Act” on one side and “Success to trade in America”on another is considered a symbol of American sentiment at the time of revolution. It fetched almost 40 times its estimated price when it was sold for $130,000 to an American collector at the Hansons Auction in 2009. 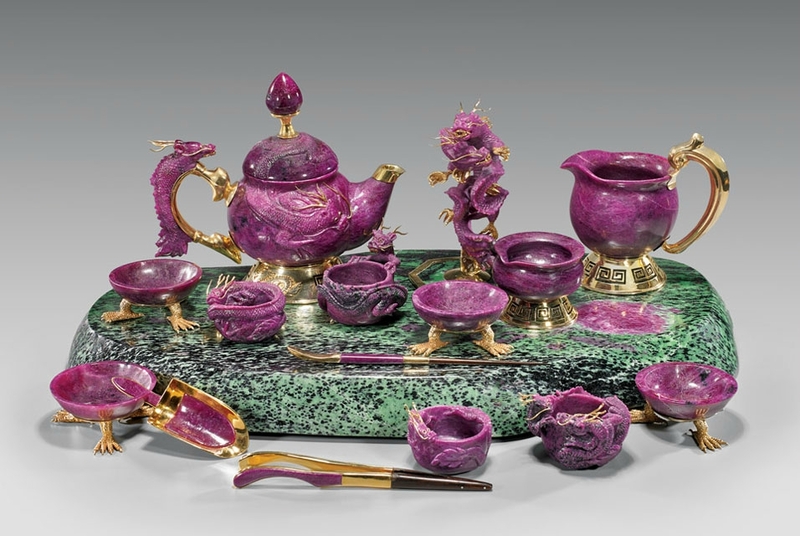 This 1927 tea set is said to be Theodore Wende’s most important and impressive works during his avant-garde period. It includes a silver and ivory teapot, a creamer, a sugar bowl and a tray which are all stamped with German hallmarks. It was purchased by an anonymous buyer for $181,000 at a Sotheby’s auction in 2007. At Sotheby’s auction in Amsterdam in 2011, an 18th / 19th century Chinese silver-gilt tea service from Qing dynasty belonging to the estate of Queen Juliana of the Netherlands was sold for $275,000. A 1927 tea infuser by Marianne Brandt has sold at auction for $361,000 breaking the sale record for Bauhaus design. Brandt’s Model tea Infuser made of silver-plated brass and ebony, was sold to a private American museum at Sotheby’s in New York on December 2014. 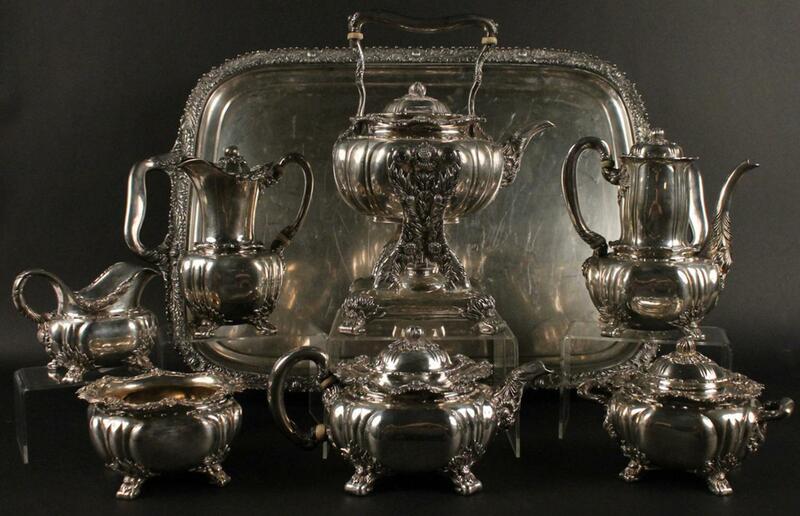 During a Sotheby’s auction in New York in 2006, a mixed metal tea service created by Tiffany’s in 1885 for Westinghouse Family using a parcel guilt technique was sold to Anthony Marks, a silver dealer for a stunning $380,000. The entire tea set is decorated with dragonflies, butterflies, other insects and of course the spider. Image copyright of Bonhams Auction House. Said to be one of the finest collections of Meissen porcelain in the world, the “Half Figure Service” is a eight piece tea set made in 1723. The tea set features “Half Figure Service” decoration which is said to be one of the most sought after types of European porcelain painting. Sold for 541,250 GBP (an equivalent of 850,000 USD at the time) is said to be one of the most expensive tea services ever assembled. Dating from the Imperial Qianlong Dynasty period, which reigned in China between 1736 and 1795, this extremely rare pair of Famille Rose Coral-Ground Teapots features landscapes painted in shades of blue and green. With an unusual shape and decorations, a flattened oval body, the pair appears to be the only two alike in the world and were purchased by a private collector from Hong Kong during a Christie’s auction for $1.26 million. Two stoneware teapots made by a Chinese master potter and artisan Gu Jingzhou fetched $1.32 million each in November 2013 during the Bonhams Hong Kong auction. The two cylindrical stoneware teapots are reddish-brown in color, and are unglazed. This lovely 1948 purple clay teapot, also made by master ceramicist Gu Jingzhou, with calligraphic engravings made by Wu Hufan and bamboo carvings made by artist Jiang Handing fetched $2 million at the China Guardian auction in Beijing in May 2010. This pair of 18th century “Melon” teapots sold for $2.18 million during the Bonhams auction at Glasgow in May 2011 to an anonymous Chinese collector and broke all previous auctions records for pottery. Sold by a Scottish family, they fetched more than six times their estimated price, becoming the most expensive pair of teapots ever sold. Officially certified by the Guinness Book of Records, “The Egoist” is the most valuable teapot in the world at $3 million dollars. Designed by British billionaire Nirmal Sethia and crafted by Milanese jeweller Scavia the teapot is embellished with 1,658 D and E colour grade diamonds and 386 rubies, with a central 6.67 carat Thai ruby.